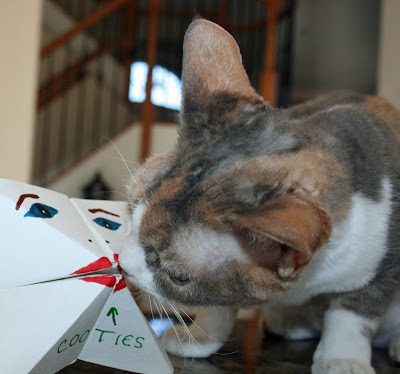 Daisy the Curly Cat: My Cootie Catcher Catched Some Cooties! My Cootie Catcher Catched Some Cooties! I have discovered that little brothers have COOTIES! I think cooties are like fleas. Only a little bit more bad. Since I do not want cooties jumping onto me, I have hired a Cootie Catcher. I hope my plan will work. Because I would not want to waste my allowance. Go ahead Cootie Catcher, get to work! I will snoopervise from over here. Okay, open up and let me see how many cooties you caught. AAAAAHHHHHHHH! It was a serious cootie infestation. Good thing I hired you. And I also decided to use the Cootie Catcher as a fashionable hat. And a second pair of eyes. I do not think there is any extra charge for this. Oh noes! Harley chewed up the Cootie Catcher. I am not sure if my insurance covers this. Cootie Catcher is getting into trouble by Harley!!! Hahahaha! Daisy, you are a scream! Oh...I do hope you removed all the cooties before you put that catcher on your head Daisy! I hope you are not thinking of taking up a career as a cootie catcher! @cos it's not very glamorous for a super model like you Daisy! Although the hat looked good! Wow that was a flash cootie catcher Miss D. I love your expression when you were checking how many you caught. The word "cooties" always makes us laugh. I don't blame Harley for chewing up the Cootie Catcher/Hat. Actually, as a hat, it's rather early Vivienne Westwood, says our Mum. 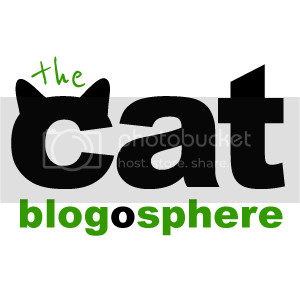 You would be a good punk Daisy, you have the right cattitude! we like the cootie catcher!!! are there pills to take to get rid of cooties?? It was a fleeting fashion moment Daisy. I do not think that insurance covers death by cat. I was wondering where you would get cootie catcher insurance. Is it a rider in the stinky goodness policy? You make us laugh and laugh, Daisy. What a creative ladycat you are. Oh no! We hope the cooties didn't get out of the catcher and get on your head. Cooties are no fun! How did Harley manage to catch them? Or is that a specialty of little boy cats? The 4th pic is way too cute. Daisy, I don't think I would waste my allowance on that cootie catcher anymore. I just love the picture where you found all of the cooties! Such antics.. I love that you look out for Harley's well being.. Maybe You will get even more Christmas treats for that !!! Oh no.. but I'm glad you got it to work before it got eatened. Thank goodness it got all the cooties before he chewed it up. Nixon would like to get one of those because he said he's sure the pugs have cooties. I had cooties back in 1979. Could have used the Catcher back then. Good job you got the cootie catcher Daisy. I've never heard of cooties though. Oh no, Harley, I hope you didn't eat the cooties! That was a silly hat anyway. Too funny! Hope the cooties didn't escape the catcher when you put in on your head! cooties? i was always told if i hung around girls i'd get cooties. poor harley. i hope your catcher rid him of them. Daisy, apparently boys have boy cooties which are repellent to girls and vice versa. So Harley (as a pesky kid brother) may need a girl cootie catcher to use on you. I don't think you can share cootie catchers. You may want to use your cootie catcher on Mister Shrill, too. I'm certain that he has cooties! very cute cootie catcher daisy! Oh, my gosh. I am dying here. That picture of Daisy "snoopervising" . . . HAW! So cute. Daisy, I'm sure your insurance will cover the destruction of the Cootie Catcher. After all, it had more than one use! 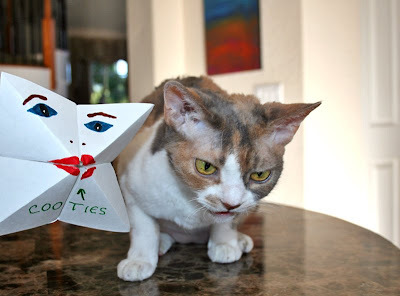 I just hope Harley doesn't get the cooties back by eating the cootie catcher. Harley's face when he gets de-cottie-fied is priceless! Did you get all the cooties before Harley killed it? Make sure you rinse & shampoo twice today...you dont want cooties on your furs..
Great idea Daisy. Both the Cootie Catcher and the hat! Harley didn't want his cooties taken away! Apparently he likes his cooties!!!!! You do look rather fashionable wearing the cootie catcher though. I wonders why the Cooty Catcher did not jest eat up Harley! PS You was brave to be so close to that crazy eyed Cooty Catcher. What a great cootie catcher! Too bad Harley chewed it! Oh no Harley chewed up your lovely Cootie Catcher. Oh dear that's such a shame. It was very lovely on as a hat! 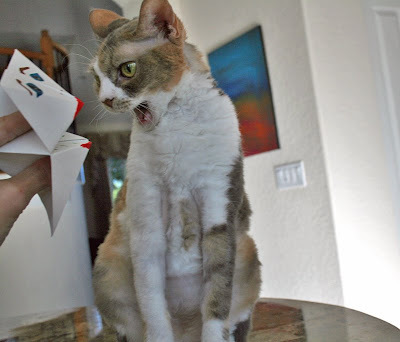 Your expression when you looked in that Cootie Catcher is so funny Daisy! You always make me smile! What a lovely new hat! My brothers have cooties too. I love the Cootie Catcher as a hat, it is very, very, very fashionable. What kind of cooties does Harley have? eew. That's sure evidence that Harley has MORE cooties, Miss Daisy! He's trying to destroy the evidence and snuff out the catcher! I'd be careful of him getting too close to you-he's probably going to unload a whole bunch of cooties onto you! Oh, I know! You need to put on your Scientist Daisy outfit and invent some Cootie Repellant for use on little brothers-I'll bet Adan would buy some and so would Sammy and Miles! WHOA! What a great idea!! I need a cootie catcher for Macy! I'm glad your cootie catcher was able to catch Harley's cooties before her bitely demise. OMC! Mama hasn't seen a cootie catcher in ages! She's giggling and giggling. have you ever got a palmetto bug? i heard about them today but never got one. *giggle*, you and Harley are adorable! Thank you for helping make my Gotcha Day so warm, wonderful, and happy! 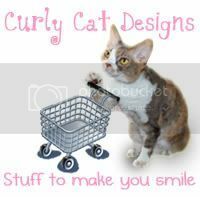 hehe I bet my bean girl wud love to has one of those! Does it work on beans too, Daisy? We thinks we needs one of dem cootie catchy thingys. Where did you get ures? We like it as a hat on ure head. You looks kinda likes a pirate. We thinks we needs a cootie catcher too! Mom!!! I guess you need a new cootie catcher now! How 'bout little sisters, Daisy? Do they have cooties too? 'Cuz I got a little sister and she can be a pain sometimes! Can I borrow your cootie catcher? BOL! That is too funny! Maybe I could hire a cootie catcher for my Mommy? 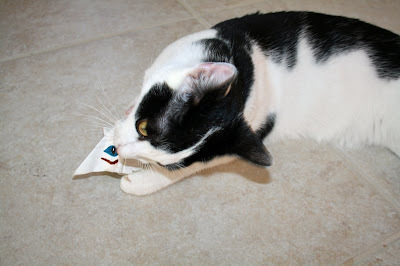 Harley probably did not know that the Cootie Catcher had already shown you all the Cootie's it captured. I think Harley should reimburse you from his allowance, instead of using your insurance. Your rates might go up, and he is the responsible party. PS: Make sure you get another cootie catcher soon! You don't want cooties. Thank you for the puzzle! I will print it out and work on it when I have my coffee. I like crossword puzzles and a Daisy one is extra special. That cootie catcher is a very good idea! You've got to be careful with little brothers - they're covered in cooties! And...you're so fashionable, I swear you can make a hat out of just about anything! Wow! The Cootie Catcher has many uses! That is so cool. Harley seemed to enjoy that Cootie Catcher nearly as much as you did, Miss Daisy! I hope your Cootie Catcher is covered by insurance. I think it is important to wear it on your head with the EYES facing BACKWARDS so Cooties will not sneak up behind you. I dont know if Cooties are very smart(? ), sorry if it doesnt work..
We've missed your humor, Daisy. Too bad Harley ate your cootie catcher. It made a nice hat. It looks like the cootie catcher is whispering sweet nothings in Harley's ear instead of catching cooties. 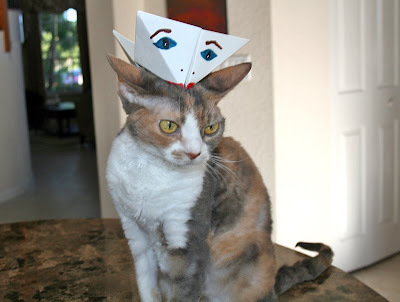 But I do say the cootie catcher sure looks good on you as a hat. P.S. Mom thought you were really "CUTE" as a fairy princess. Mommy works with nurses, she needs one of these too. Daisy, your expressions are adorable. How is Harley doing? Is he healing up? That sure is a neat cootie catcher! If Harley chewed it up then he should have to pay for it out of his allowance! HAHAHAHAHAHAHAHAHAHA Daisy! Sometimes you just crack us up! Thank you so much for coming to Ruis birthday party! It wouldn't have been the same without you! You are hilarious! You make our MamaCat laugh every day! What a cute cootie catcher...does it work on children? I think that the Cootie Catcher would be fun to play with like Harley did! HAHHAH AAAHHHH your face being scared-ed of all the cooties it caught scared-ed me too!! Not coz of the cooties but moreso coz I can't see your teefs, you look likke a gummy old lady!! Oh no! I hope your shook out that infestation before you put the cooties catcher on your head. 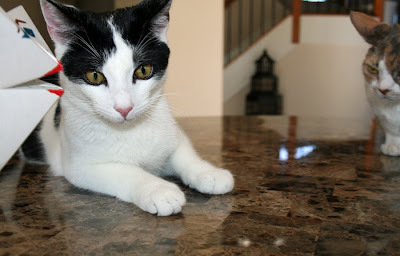 Hi Daisy, it's me, Tosca's cat brother Mojo. You are a very lovely cat. Do you date? 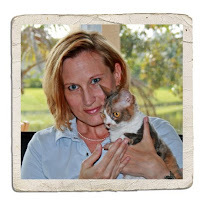 I'm just a street cat but as you can see on the blog I can pass for Russian Blue to people who don't wear their glasses. Also, my sister $nack thinks Harley is the bomb. I suspect that my little brother has cooties too. I am so glad you showed me how to de-cootify him. I love it! This is just too darn cute! Can yoo chek my mowth for cooties? ?